Horace Silver, piano; Bob Cranshaw, bass; Roger Humphries, drums. As these words are written, the most successful year in the history of the Horace Silver Quintet is drawing to a close and a new year is beginning that will bring, among other rewards, the tenth anniversary of Horace's career as a leader. It hardly seems possible that a full decade can have elapsed since he graduated from his role as pianist with Art Blakey's Jazz Messengers, yet the calendar assures us that the time for that celebration is only months away--a premature Silver jubilee, so to speak. Followers of the Silver trail may not be aware of it, since they do not read the trade papers, but Song For My Father was a remarkable commercial hit. Not only did the album remain on the best seller charts for many weeks, but the single sold unusually well for a jazz single, and the album was also named by Down Beat readers among the five top LPs of the year. Small wonder that Horace recently was in a mood for celebration. His formula for rejoicing took the shape of a special guest star added to the latest Silver session. "I've always wanted to use J.J. Johnson on one of my dates," says Horace, "but somehow it usually seemed that one or the other of us was out of town, or for some other reason we couldn't get together." Of the six compositions introduced on these sides (five of them Silver originals) each one has its own individual attraction, so much so that it is even more difficult than usual to predict which will turn out to be the one with the greatest popular appeal. 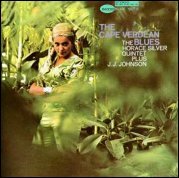 However, for reasons that can be deduced from Horace's personal comments on this liner, a likely candidate is "The Cape Verdean Blues." It's interesting to note the alternation of phrases during Horace's solo, which suggests a sort of call-and-response between the right and left hands. Horace maintains the intensity as Joe Henderson takes a remarkable solo. The singular manner in which he articulates, the use of short phrases, and the skill in which he builds are worthy of note. "The African Queen" has a stealthy, easy quality, yet never locks for force of expression. Roger Humphries' drum fills are such an important part of the opening passages that his work achieves an almost melodic value. Joe Henderson's solo, which at first displays a warmth of sound reminiscent of Ben Webster, moves skillfully in and out of the freedom bag. Woody Shaw's solo offers strong justification of Horace's enthusiasm. You feel almost immediately that it will not be long before Shaw's solos on records will be immediately recognizable, so potent is the evidence here of the maturing of a new personality. Horace himself offers a simple and moving solo, in which even the quotes are so well placed and timed that they never seem out of context. After the unison ensemble there is a long repetition of a vamp by the rhythm section, and a delayed ending in which those lost few gratuitous notes by Bob Cranshaw suggest that he, along with the rest of the group, was sorry to see it end. "Pretty Eyes" comes as a real surprise; it's Horace's first recorded original jazz waltz. "It's not actually the first waltz I have ever played," Horace reminded me. "In the Horace-Scope album I recorded a waltz called 'Without You,' but it was written by Don Newey." The delay in his decision to come to compositional terms with three-quarter time was not due to any antipathy toward the meter on Horace's part; it was just that the right melody did not occur to him, and possibly my fellow-Virgo did not feel until now that the time was right. Be that as it may, "Pretty Eyes" is a beguiling work in E Flat minor, constructed in 16- and 18-bar passages. There is one particularly charming brief interlude where the melody goes into A major and G major. Joe displays his sensitive feeling for the changes and Woody, with a solo that is both lyrical and facile, reminds us of Horace's tribute to his technique. On this track Horace's patience (and ours) in the long wait for waltz inspiration is well rewarded. Although the tracks on the second side are as typical of the Silver sound as those on the first, there is of course an important difference. For the first time, because of the presence of J.J. Johnson, Horace was able to write for a three-horn ensemble. The instrumentation offered other new opportunities, such as the creation of two-horn backgrounds for solos. Nutville was so called, says Horace, "because the harmonies in the tune and the voicing sound kinda nutty." The tempo is brisk, Humphries adding considerably to the spirit with a richly dynamic beat. J.J.'s solo needs no comment from me beyond an acknowledgment that the style he originated more than twenty years ago has matured and broadened, and that despite the proliferation of imitators there is still no way of replacing a genuine article, in jazz or any other art. "Nutville" cooks like crazy from top to bottom. "Bonita," a comparatively uncomplicated melody, opens with a bass figure and, like most of Horace's themes, is in the minor mode. "This is somewhat in the vein of a piece I wrote years ago," Horace points out, "a number called 'Enchantment' in the old Six Pieces of Silver album." Though this C minor wail is not a blues in any technical sense, there is something of the aura of the blues about it, especially during Horace's solo. Joe Henderson, J.J. and Woody Shaw all capture the groove that has been established by the theme and consolidated by the piano. "Mo' Joe" is the latest illustration of Joe Henderson's talent as a composer. Like his contribution to the last album ("The Kicker") it's simple in form (the traditional 32-bar structure is employed) but tricky in the rhythmic character of its phrases. Says Horace, "The title simply means 'More Joe' and is not to be confused with 'I Got My Mojo Working." Listen particularly for the magnificent blend, in J.J.'s solo, of the four essential elements of all superior jazz improvisation: originality of style, technical control, a personal sound and an endless flow of ideas. Everybody worked on this one: Joe swings with a fine sense of continuity, Woody displays emotional as well as technical maturity, Horace cooks as only Horace can, and Bob Cronshaw walks awhile with a fine, strong sound. "J.J. was wonderful to work with," says Horace. "He is notonly a great musician but a very cooperative person. It was a tremendous kick to have him work with us." As you might guess, the feeling was mutual. From the almost unknown newcomer Woody Shaw to the long established jazz giant J.J., this album demonstrates how well musicians of different eras can work together, especially when they have a man like Horace Silver as the center of their magnetic field. --LEONARD FEATHER, from the liner notes.